BUSINESS momentum hotted up along with the June westher in a series of events, starting with a presentation by the Woking News & Mail at a breakfast meeting at DoubleTree by Hilton, reports Paul Webster, Woking Chamber of Commerce Business Development Director. 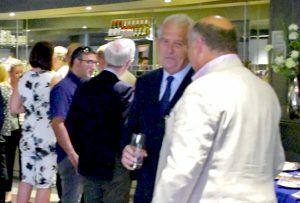 I visited Chamber membera, HG Wells Conference & Events Centre, on 7 June for the launch of their new menu, by Chef Steve Tremblay, who has worked for Simon Cowell and for Mclarens and not surprisingly the food on offer was fabulous. Well done to them!